While the Defense Department’s Inspector General has received about the same number of complaints annually against admirals, generals and senior civilians in recent years, the number of cases they are deciding to probe has dipped, according to a recent report by the Pentagon watchdog. The IG received 711 complaints of senior official misconduct in Fiscal Year 2015 and conducted a full investigation of 34 percent of those allegations, according to a report released last month. In the fiscal year that ended Sept. 30, the IG investigated 19 percent of 785 complaints. That represented a stark drop from the 74 percent of of 395 overall complaints it opted to investigate in 2008, according to the report. At the same time, the percentage of senior complaints that are substantiated is on the rise, from 26 percent in 2015 to 32 percent in Fiscal Year 2018, which ended Sept. 30. The IG substantiated just 14 percent of investigated complaints in 2008. While the substantiation rate is on the rise, the actual number of misbehaving leaders is down. 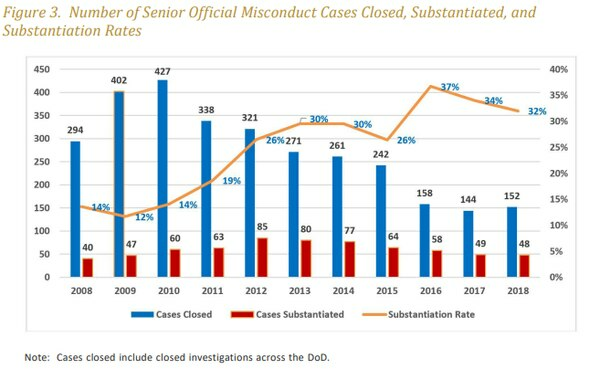 In 2018, 48 military and civilian brass had misconduct allegations substantiated against them, down from 49 in 2017, 58 in 2016 and 64 in 2015. The most complaints received and substantiated both occurred in 2012, with 85 of 815 complaints substantiated. 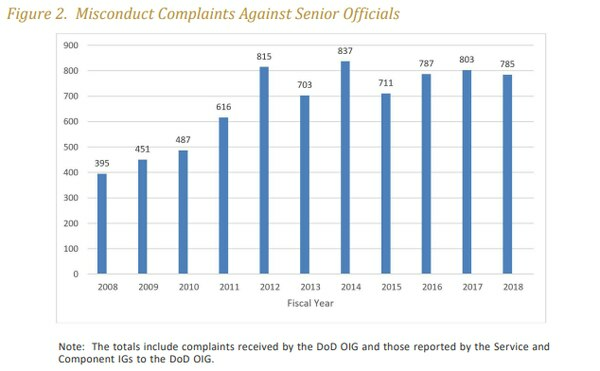 While the IG opted to investigate fewer senior misconduct allegations in recent years, the number of complaints they receive annually has largely remained steady. Senior complaints jumped from 395 in 2008 to 815 in 2012 and have not dipped below 700 a year since then, according to the report. The report does not explain how the IG decides whether a complaint warrants a full investigation. The report cites several instances of recently substantiated senior misconduct. An Army two-star was found to have had inappropriate online conversations with an enlisted soldier’s spouse “using flirtatious language and sexual innuendo,” the report states. 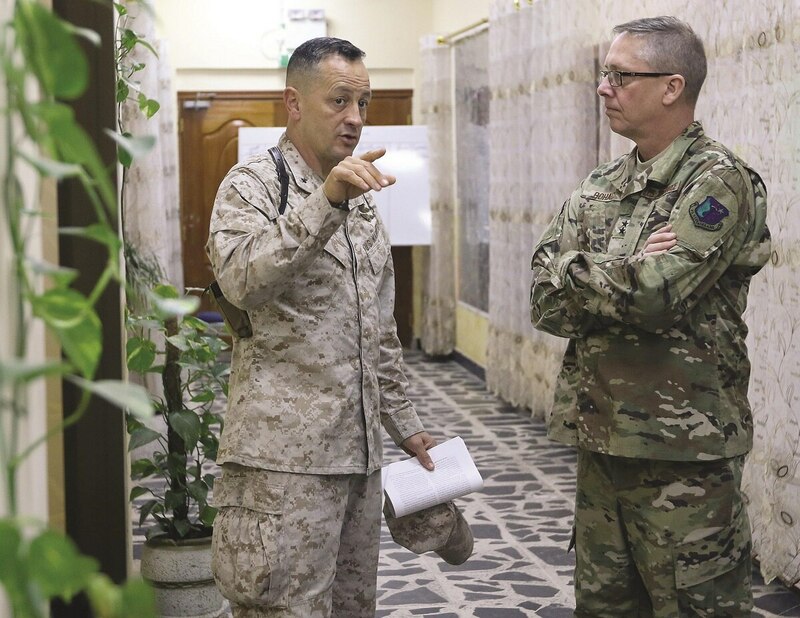 A Marine Corps brigadier general requested or allowed his aide to perform errands and tasks that were non-governmental, while an Air Force senior executive arranged temporary duty travel to New Mexico for his personal benefit. The report does not name the one-star, but the IG reported earlier this year that Brig. Gen. Rick Uribe had used his aide for personal chores and other non-work duties. The one-star general was hit with an administrative punishment. An Army civilian leader used racial slurs and made disparaging and inappropriate comments. “The member also misused a civilian subordinate for other than official purposes when she frequently directed that employee to fax her animal insurance claim forms,” the report states. Over in the Navy, a rear admiral “wrongfully disclosed protected personal information to non-Government personnel,” the report states. There are 963 general and flag officers in the Defense Department, along with 1,364 Senior Executive Service members. Such senior officials may face misconduct allegations at some point in their careers “by virtue of their positions” according to the report. While the number of days required to complete senior official investigations has gone up in recent years, the IG report saw those numbers drop from an average of 455 days in 2017 to 250 days in 2018, according to the report. The report blames the lengthy process on a lack of resources to conduct senior official investigations. Such a process is also lengthened because investigators give the wrongdoers the chance to comment on an investigation’s conclusions. “This allows the subject to provide the investigators with any additional information the subject believes is relevant, and to correct any inaccuracies in the report before it is completed,” the report states. An investigation that drags on can affect morale, promotions and retirement plans.